Amidst the sturm und drang of consolidation, the Board of Trustees chose a short list of presidential candidates, interviewed the top four, and then selected the next USF president, all in one week. Then last week, the State University System Board of Governors approved the USF Trustees' choice, so we have a new president come summer. A New President. Steven Currall is an expert on (and active researcher in) organizational psychology, with two decades of experience as an academic administrator. For details, see below or click here. Q: Isn't it better to wait until the figure is published? If I try to lobby him now, he won't say anything. A: You don't want him to say anything; you want him to do something ... If you wait, the figure will be published, and everyone will be committed to it. They'll have to stick to it to save their faces. If you want to change government decisions, you have to do it before anybody knows they're being made. The USF Chapter of the United Faculty of Florida will meet tomorrow Friday at noon on USF Sarasota / Manatee in room A 203A. On the agenda: bargaining, consolidating USF, the new USF president, plans for the fall recruiting campaign, and the proposals for the referendum on amending the UFF USF Constitution and Bylaws. For details, see the agenda. Come and check us out. This spring, we will meet on April 5 on USF Sarasota / Manatee in A 203A and on April 19 on USF Tampa in EDU 317 at noon. All meetings are announced on the calendar of Upcoming Events. Come and check us out. Last week, the State University System Board of Governors, following the recommendation of the USF Board of Trustees, chose Steven Currall to be USF's new president. President-elect Currall comes to USF from Southern Methodist University (SMU, "World Changers Shaped Here! "), a private university in Dallas, Texas, under the jurisdiction of the United Methodist Church, a mainstream Protestant denomination. The the United Methodist Church confirms SMU's "historical commitment to academic freedom and open inquiry"; SMU is also the home of the George W. Bush Presidential Center. SMU is ranked # 59 among national universities by US News & World Report with 11,789 enrolled (USF is ranked # 124 with 43,549 enrolled); the Carnegie Classification of SMU is as a doctoral university with high research activity and no medical school, while USF Tampa has very high research activity (and, of course, a growing medical school). 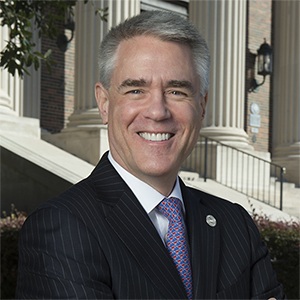 Currall is provost and vice president for academic affairs at SMU, and simultaneously a professor of Management and Organization, of Psychology, and of Engineering Management, as well as being David B. Miller Endowed Professor in Business. Wikipedia describes Professor Currall as a "psychological scientist," and the American Association for the Advancement of Science elected him a fellow in 2013 when he was dean of the UC Davis Graduate School of Management as well as Faculty Advisor and Senior Advisor for Strategic Projects to the Chancellor (in the University of California, each university is led by a chancellor, and the entire system by a president). UC Davis noted his "scholarly analysis of public awareness of new technologies" and that he taught "organizational psychology topics such as innovation, emerging technologies, negotiation and corporate governance." Steven Currall received a Ph.D. in Organizational Behavior from Cornell University in 1990, for a thesis on The role of interpersonal trust in work relationships. He spent three years at Temple University as an assistant professor of Human Resource Management, then twelve years at Rice University, with appointments in Management, Psychology, Statistics, and ultimately the Sick Professorship of Entrepreneurship in Engineering; while he was there, he founded the Rice Alliance for Technology and Entrepreneurship. Then after three years in University College London, where he launched the Department of Management Science and Innovation (in Engineering) (he also was Vice Dean of Enterprise), he went to UC Davis in 2009. Neither his resume nor his Wikipedia article say much about his academic research, but despite his administrative duties, he has continued to publish (including a book in 2014), with 45 citations in Google Scholar. He has written on a variety of topics, including trust in organizational relationships, perceptions of nanotechnology, and workplace diversity. In scale and mission, USF is more like UC Davis (an AAU member) than SMU - but USF has slightly more students and substantially less than half the funding than Davis. So there will be challenges. Unlike UC Davis and SMU, USF has a faculty union - but then so did University College London, so dealing with the four + one unions at USF will not be an entirely novel experience for him. We look forward to working with President Currall. Chapter Meeting tomorrow Friday, April 5, at noon, on USF Sarasota / Manatee in A 203A.